Big surprise from what I was expecting. Compared to past Infinite Heroes offerings this one takes the cake, especially in terms of articulation. The Fwoosh has more photos of the complete set at their site. You can get to the main article HERE. This entry was posted in Collectibles, Flash News and tagged Barry Allen, Infinite Heroes, SDCC, Starro, The Flash, The Fwoosh on July 18, 2010 by Devin. 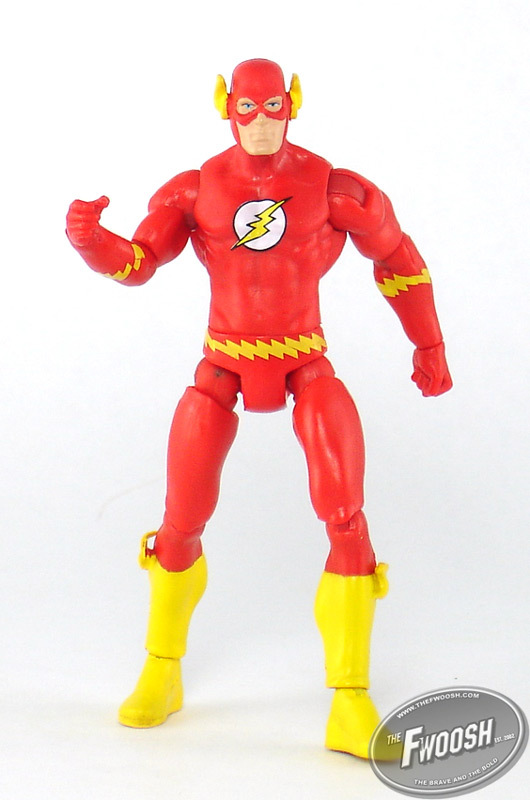 San Diego Comic-Con 2010 Flash-related Exclusives Update! 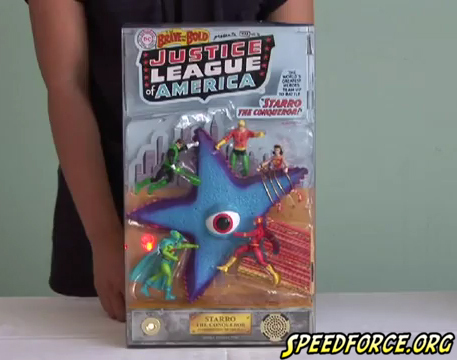 Back in April Speed Force posted news about the SDCC 2010 Exclusive Starro the Conqueror action figure with the original Justice League of America. 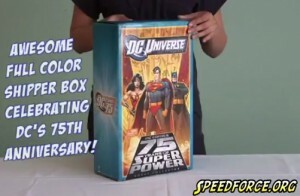 In celebration of the 75th Anniversary of DC Comics the packaging is based on the milestone Silver Age cover, Brave and the Bold #28, featuring the first appearance of the Justice League. Along with an 8″ bendy Starro we get 3 ¾ classic versions of Wonder Woman, Green Lantern (with a brand new construct add-on), Aquaman, Martian Manhunter and of course The Flash, all with slightly improved articulation (well at least when compared with the older Infinite Heroes figures) . A few days ago Mattel released a video showcasing all the features and packaging of the Exclusive Starro Set including flashing lights and Kevin Conroy of various animated Batman projects lending his voice to give us individual bios of each member of the Justice League and a synopsis of Brave and the Bold #28. All of which sounds pretty nifty. I mentioned before that this may be one of the few things that I keep mint on card and this video has pretty much sealed the deal. It’s obvious from the final product that Mattel’s designers put a lot of thought into this. We even get a commemorative shipping box, which I will also be hanging onto. I know a lot of people aren’t really fans of the Infinite Hero toy line, so I’m wondering if this will impact them purchasing it. Even if I weren’t already a fan of the little guys, the packaging and the fact that the Flash is included almost automatically guarantees my purchase. Mattel thrives off of people like me. Well sort of. Apparently the SDCC Exclusive Spores are for use for the full size DCUC figures instead of the included Infinite Heroes. Probably really cool for some people, not so much for me. 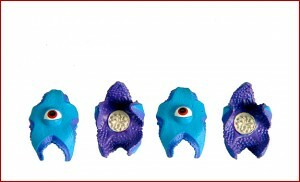 Although if they used Papa Zero‘s idea and made a Starro sleep mask I would be all over it. And a picture of the Starro Spores if you haven’t seen them yet. These are only compatible with the DC Universe Classics 6″ figures. Starro and his Justice League combatants will be available to purchase at San Diego Comic-Con 2010 this weekend (July 22-25) with the exclusive Starro Spores included. They will be available to those not attending SDCC 2010 (and those not willing to pay scalper prices on eBay) on Mattycollector.com August 2nd minus the Starro Spores. Also for those actually attending SDCC, Mattycollector for the first time is taking presale vouchers for their exclusives. Basically you can order the item ahead of time and go to a special room during SDCC with the proper credentials and simply pick up your item free of headaches and worries. Mattel says there will be plenty of items available and I really hope they mean it. I don’t think anyone wants a repeat of the Gleek Incident from last year. I personally don’t really care for the idea of event only exclusives but it seems to be popular. What do you think about event only exclusives? 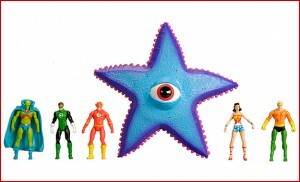 And will you pick up Starro and the JLA? Let us know, we would love to hear from you. 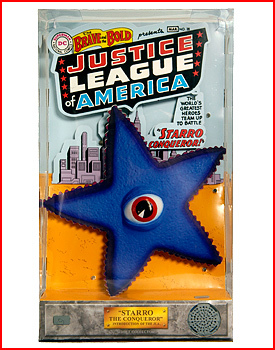 This entry was posted in Collectibles and tagged 3 ¾, DC 75th Anniversary, Infinite Heroes, Justice League of America, Mattel, SDCC, Silver Age, Starro on July 13, 2010 by Devin.